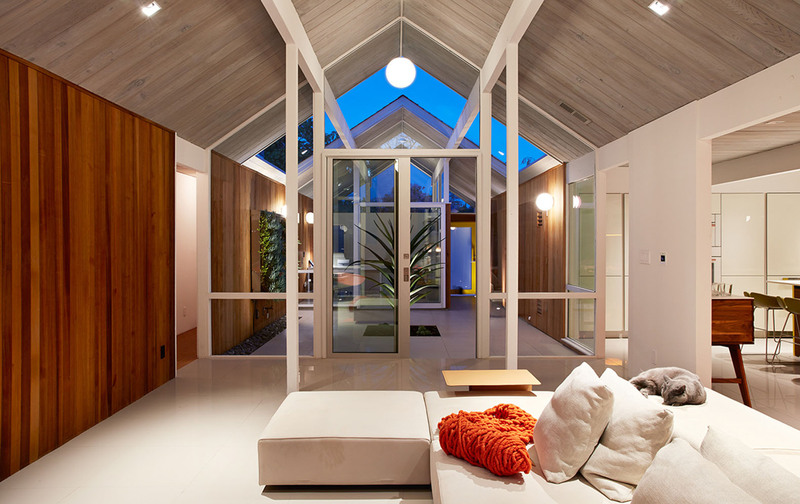 The experts behind remodeling classic Eichler homes have done it again. 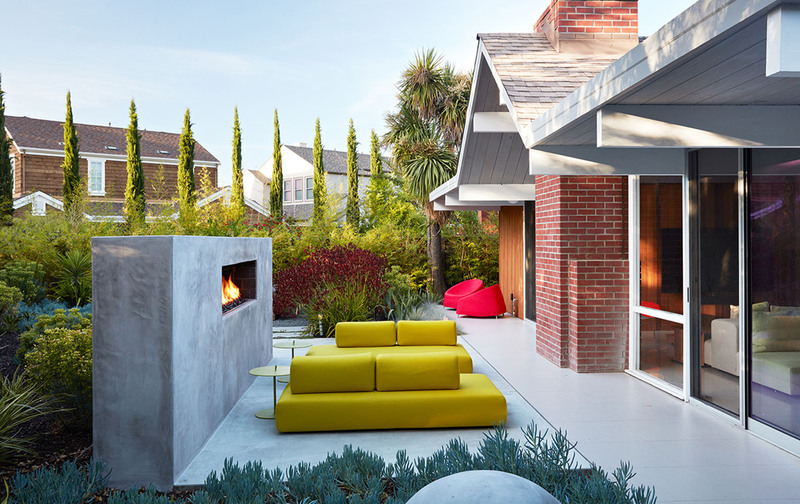 This time, Klopf Architecture applied their extensive experience with mid-modern architecture to a double-gable residence in Mountain View, giving it a modern makeover while updating the best of its classic Eichler features. The owners commissioned Klopf Architecture to remodel their single-family Eichler home in the heart of the Silicon Valley. A subtle interplay and continuity of materials dominates the entire property. A new, natural wood exterior siding was introduced to both the interior and exterior, while walnut vanities and cabinets offset the home’s white walls. Gray porcelain tiles echo the concrete slab floors and appear on the exterior, unifying the spaces and creating an appearance of flow. Large floor-to-ceiling windows allow the living room to spill out onto the patio and rear garden, which was redesigned by Outer Space Landscape Architects. The architects tucked the head of the bed in the master bedroom within a line of built-in wardrobes with a high window above. This wardrobe wall replaces the master closet and provides additional space for the bathroom. It just doesn’t get much better than this. 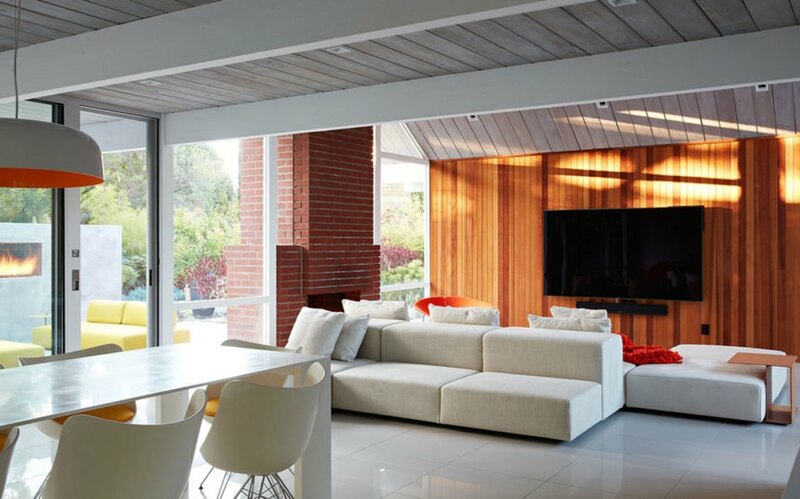 The owners commissioned Klopf Architecture to remodel their single-family Eichler home located in the heart of the Silicon Valley. A subtle interplay and continuity of materials dominates the entire property. A new, natural wood exterior siding was introduced both the inside and outside of the house, while walnut vanities and cabinets offset the white walls of the residence. Gray porcelain tiles echo the concrete slab floors and appear on the exterior side, unifying the spaces and creating an appearance of flow. Large floor-to-ceiling windows allows the living room to spill out onto the patio and landscaped rear yard redesigned by landscape design studio Outer Space Landscape Architects. The architects tucked the head of the bed in the master bedroom within a line of built-in wardrobes with a high window above. This wardrobe wall replaces the master closet and provides additional space for the bathroom.